The sharp contrast between the lives in cities and countryside always truck me. Submerged under the glamour of the modern metropolis, the poverty in the vast rural area is overwhelming. As I traveled, I started to focus on the migrant workers, whom I believe have contributed the most to China’s prosperity but benefited the least… On a national level, China is dashing to become a richer country. Should tradition, morality and humanity be drowned in a world of tireless rumbling factories is the question we should ask. — Lixin Fan, from his director’s statement. Every winter, the world’s largest human migration occurs in China, as many of its 130 million migrant workers in the cities make the arduous trek home to their families for the Chinese New Year. 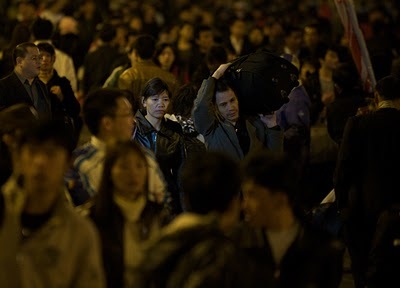 These scenes of the teeming masses of humanity clogging train stations, desperately trying to get their only chance all year to visit their loved ones, are some of the most startling images of Lixin Fan’s superb, heartbreaking documentary Last Train Home. Fan, a Chinese-born, Montreal-based filmmaker, began his career as a journalist for the Chinese national TV broadcaster CCTV, and as the above epigraph indicates, it was there that he began to be interested in the ever widening gap between the rich in the cities and the poor in the countryside as China embarked on its dizzying rush toward world economic dominance. 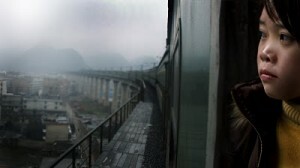 However, as China isn’t exactly a bastion of journalistic freedom, it’s not too far off base to speculate that Fan moved into independent filmmaking (as well as to Canada) in order to more freely explore the massive societal upheavals that have occurred in China as a result of its drive toward greater prosperity. What Fan illuminates with penetrating acuity and sometimes uncomfortable intimacy in Last Train Home is the fact that this prosperity is largely the result of the efforts of these many millions of migrant workers, who travel many miles from their rural homelands to Guangzhou, Shenzhen, and other industrial hubs to toil for many hours in factories to make the products that those in more affluent parts of China and overseas enjoy. However, these workers have very little share in the massive riches that this activity brings to others. They are low-paid, have very little rights to workers’ compensation and social services, and, most pertinently for this film, are prevented from bringing their families with them, due to China’s very strict residency laws. This serves to break families apart, as parents are forced to be away from their children for months and sometimes years at a time, leaving children to be raised by their grandparents and other relatives. The absence of parental structure and authority causes a whole host of problems, not the least of which is delinquency and aimlessness among the younger generation. These issues are given indelible life by the case of the Zhang family, the troubled unit Fan focuses on in the film. Zhang Changua and his wife Chen Suqin are factory workers in Guangzhou, who left their village home in Sichuan province and their newborn daughter 17 years earlier to seek work in the cities. They have since regularly sent money home, while their daughter Qin and younger son Yang were raised by their grandmother, so that their children will have enough money to attend school, and hopefully, escape the hard fate of their parents. Tragically, these hopes are dashed by Qin, who has grown up with seething resentment at what she sees as essentially abandonment by her parents, who are virtually strangers to her, since she has seen them so seldom over the years. She feels oppressed and smothered by their expectations of her, and sees their parental authority over her as illegitimate. “All they care about is money,” Qin says at one point, her voice dripping with scorn. She also hates having to work on the family farm with her brother and grandmother, and describes her school as a “cage.” Her restlessness and yearning to be rid of these strictures on her personal freedom eventually leads to Qin fulfilling her parents’ worst nightmare: she drops out of school and becomes a factory worker in the city. Qin doesn’t really enjoy this work either, but she takes solace in the fact that she at least earns her own money and can feel that she has greater freedom, however limited or illusory it may be. Qin’s mortified mother and concerned father embark on a rescue operation to convince Qin to return to the village and finish her schooling; they also want to ensure that her brother doesn’t follow her example. They all go back home for New Year’s, Qin sullen and reluctant. Back home, this sets the stage for a dramatic confrontation, one that is predictable if we pay close attention to Qin’s moods, but is no less shocking and tragic. Last Train Home bears some stylistic resemblance to another Canadian documentary about China, Yung Chang’s Up the Yangtze, which followed stories centering around the Three Gorges Dam project. Fan worked on that film as an associate producer and a sound man, and Chang was a consultant on Fan’s film. Both directors share an emphasis on individual stories set against a larger societal backdrop, and making clear how the macro and micro aspects of their subjects’ situations entwine. Fan eschews voiceover and uses music sparingly, constructing his documentary with a dramatic arc similar to fictional films. Fan prominently name-checks Jia Zhang-ke in interviews as a major influence; and indeed, Fan’s concerns dovetail with Jia’s ongoing project to record the effects of China’s massive social changes on the daily lives of people. Fan, however, brings an intense intimacy to his material that is all his own. Fan’s camera (he did his own cinematography) is an unseen character of this drama; it is not the Frederick Wiseman-like objective fly-on-the-wall, but rather a sympathetic confidante. Fan’s prodigious gifts of observation (in abundant evidence in his depiction of the massive crush of travelers at the Guangzhou train station, just barely controllable by the police) honor all his subjects, whether they are the main characters like the Zhangs’ or someone glimpsed for a few seconds, affording them the respect and dignity that they are too often denied. The overwheming impression that I took away from Last Train Home was not how unique the Zhangs were, but to the contrary, how typical they were. A film just as compelling could conceivably be made of the lives of any of the millions taking the trains every year, and I think this is Fan’s main contention. A country that compels so many to tear apart their own families and toil away at numbing, repetitive labor with little to look forward to except a never-ending struggle, is a country that is deeply in trouble, despite the efforts of governments to whitewash this fact, or offer temporary distractions such as the Olympics. It is a situation that will eventually prove to be unsustainable. Last Train Home, beyond being a deeply moving work of art, is a passionate wake-up call, vividly illuminating issues that the powers that be will ignore to their peril.